Barbara Ann’s BBQ If you were worried that this barbecue gem was down for the count, rest assured that the smoker is once again burning. The sage- and fennel-flecked sausage is still custom-made by a local sausage maker and still gets significant smoke time over the smoldering hickory and cherry wood. Rib tips remain the juiciest pork option (over the often drier spare ribs) and also the best value. Skip the beef ribs; spend the dough on “Miss Winters’” outsourced 7UP, sour-cream and chocolate cakes instead. 7617 S Cottage Grove Ave (773-651-5300). El: Red to 79th. Bus: 4, 75. Lunch, dinner (Tue–Sat) (closed Sun, Mon). Average main course: $9. Fat Willy’s Rib Shack Can good barbecue exist on the North Side? We think so, and this is proof. Instead of the South Side tradition of cash ’n’ carry, here there’s an actual dining room, a comfy spot with a beer and wine list and a house cocktail called the Hogarita (think cran-citrus margarita). For starters, skip the Eckrich-like hot links and go for the smoky, greasy rib tips and an insanely rich mac and cheese. Move on past boring salads to a slab of baby backs and the beef brisket sandwich with caramelized onions and horseradish. Add a touch of sauce to the latter; both the tangy mild and the smoky hot are tasty. 2416 W Schubert Ave (773-782-1800). Bus: 49, 76. Lunch, dinner. Average main course: $11. Honey 1 BBQ The father and son behind this rib house know a thing or two about barbecue, hailing from a part of Arkansas where smokers are more common than microwaves. 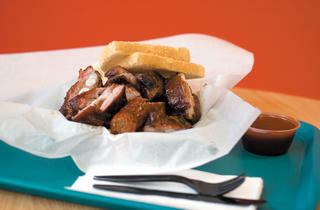 Their style of ’cue employs real wood (rather than gas) to impart smoky flavor on slow-cooked meats. 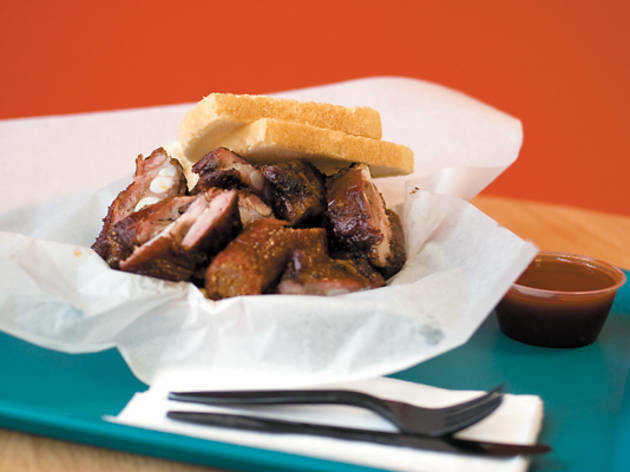 Bring a hungry crew, stake out a table in the simple but spick-and-span dining area and order up a couple of slabs of meaty, tender spareribs, a whole mess of rib tips and a plate of hot links. If you’re still hungry after the main event, juicy smoked chicken and crispy catfish should round things out. 2241 N Western Ave (773-227-5130). El: Blue to Western. Bus: 49, 56, 74. Lunch, dinner (closed Mon). Average main course: $9. P&P BBQ Soul Food Take a glance at the dry-erase board you’ll pass on your way into this family-run soul-food spot—it lists all of the day’s specials you’ll be recounting later to friends and eating for leftovers the next day. Though the giant smoker may not be fuming while you’re there, rest assured it sees some action, and the tender, if mild, jerk chicken and sauce-slathered rib tips that come out of it are mighty tasty. Ham-studded greens in plenty of pot likker are among the best in town, and a carryout wing deal for three bucks beats the pants off those extra-value meals this area’s littered with. 3734 W Division St (773-276-7756). Bus: 53, 65, 70. Breakfast, lunch, dinner. Average main course: $8. Uncle John’s Behind the glass curtain at this Park Manor carryout spot, Arkansas-native Mack Sevier smokes some of the best stuff in town. Go for the rib tips and hot links combo: The rib tips are smoky, extremely juicy, meatier than elsewhere in town and crisp around the edges. The hot links are not for the heat phobic, with searing bits of red chile and smoky, porky, sage-packed flavor—like a spicy breakfast sausage. Opt for the mild sauce unless you’re prepared for a scorcher, and request extra napkins if you want to save your car seats. 337 E 69th St (773-892-1233). El: Red to 69th. Bus: 3, 30, 67, 71. Lunch, dinner (closed Sun). Average main course: $9. Wallace’s Catfish Corner This sunny, clean-as-a-whistle catfish ’n’ barbecue hut houses some seriously tasty soul food. The cornmeal-crusted filet of catfish and butterflied shrimp are heart-stoppers but worth the risk, and the messy “mini” rib tips are anything but mini—they’re twice the size of any we’ve seen elsewhere. Soulful sides are mandatory: gooey mac and cheese, fried okra, slow-simmered greens and the creamy banana-pudding finale. Rounding out the menu are burgers, but if you go late, most of the food has already been snatched up, and pickings are slim. 2800 W Madison Ave (773-638-3474). El: Green to California. Bus: 20, 52, 94. Lunch, dinner. Average main course: $7.